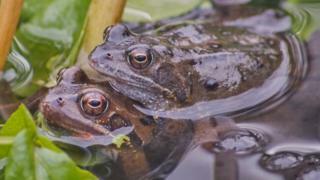 Garden ponds are playing a role in the spread of deadly frog diseases across the UK, a study suggests. Ranaviruses can infect amphibians, reptiles and fish. In the UK, they have devastated common frog populations. This research suggests that the introduction of infected animals from aquatic retailers into ponds or moving species between different ponds may be exacerbating the problem. The findings are published in the Proceedings of the Royal Society B.
Dr Trent Garner, from the Zoological Society of London (ZSL), told BBC News: "The virus seems to be spreading at a rate that exceeds the ability of a frog to hop, and there seems to be human-aided dispersal of the virus." Ranaviruses are a group of viruses found across the world and they affect different species in different ways. In the UK, one type of ranavirus was found to be present in the South East of England in the 1980s, and it has since spread. It can kill common frogs either by causing sores and blisters to form on the animal's skin or by causing their internal organs to bleed. "In a certain proportion of populations, the disease persists. And when it persists, frogs decline by around 85%, and they don't seem to be recovering," said Dr Garner. To analyse the movement of the disease in the UK, scientists looked at two decades of data recorded by a citizen science scheme called the Frog Mortality Project, which is now coordinated through Garden Wildlife Health. Genetic records suggested that ranavirus was not always present in the UK, and had probably been introduced to the UK on two separate occasions. The study also found that while infection is spread by the natural movement of amphibians, garden ponds could also be playing a key role. Dr Garner said: "Potentially garden ponds can act as stepping stones for infected animals to move around and reach new sites." He said that taking frogspawn or frogs from one pond and placing them in another could be helping to spread ranavirus. "There are also other species that could potentially carry ranavirus - ornamental fish for example. So I do think there is a case to be made to investigate their role in infections." Lead author Dr Stephen Price, from University College London, ZSL and Queen Mary University of London, said: "Ranavirus is one of the most serious health threats currently facing the UK's amphibian population. "So our findings that humans seem to have helped move the virus around, facilitating its rapid spread, could be translated into some straightforward ways to manage the risk of disease outbreaks." He added: "We certainly don't want to discourage people from adding ponds to their urban gardens - this remains one of the most positive steps we can all take to support wildlife. "But equally we would strongly urge people to try to limit how much potentially-infectious material they're moving into and out of their gardens in the process."